Coat a large deep skillet or pot with vegetable oil. Saute onions until almost tender over medium heat and then add in garlic. Cook until onion and garlic are fragrant, about 2-3 minutes. Season broth with smoked salt and red pepper flakes. Taste and adjust the seasonings if needed. 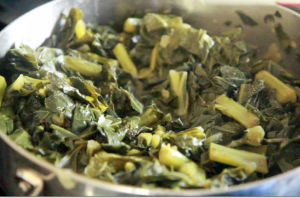 Make sure it's to your liking because this is how your greens will taste. Bring to a simmer and reduce heat. Add in the greens. Green will wilt down as they cook. Simmer for 1 hr to 1 hr 30 mins. Do not boil. Add more vegetable broth if needed. May need more or less time so be sure to check them after 30-45 minutes. When done, greens will be dark green, tender and will not have a raw taste. Add hot sauce or vinegar if desired. ~TIPS~ Any type of smoked salt can be used. Cooking time may vary. Add fresh tomatoes and red peppers if desired.